""" A simple Token structure. Token type, value and position.
""" A simple regex-based lexer/tokenizer. of the token to return when it's recognized.
""" Initialize the lexer with a buffer as input. the position of the error.
""" Returns an iterator to the tokens found in the buffer. # names and map them to token types. The re.MatchObject.lastgroup method provides the name of the last group that matched in the regex run, and can be used to efficiently find which rule matched the current token. This optimization makes the lexer more than twice as fast! Why does this make sense? First, if you think about it in the simplest way possible, the iteration over rules moved from Python code to C code (the implementation of the re module). Second, it's even more than that. In the regex engine, | alternation doesn't simply mean iteration. When the regex is built, all the sub-regexes get combined into a single NFA - some states may be combined, etc. In short, the speedup is not surprising. My benchmark is pretty simple. I combined a number of TableGen source files into a single one that has ~20 KLOC and weighs around 1 MB; then I wrote down the lexical rules needed to tokenize TableGen and ran the lexer on the whole file. TableGen is a simple programming language, so this is a good simulation of reality. The first approach, "multi-regex" runs in 1.23 seconds on my machine. The second, "single-regex" runs in 0.57 seconds - 2.15x speedup. // - name: name of the pattern that this token matched (taken from rules). // - value: actual string value of the token. // - pos: offset in the current buffer where the token starts. // an error throws Error. // If we're here, no rule matches so it's an error. Note that the whitespace skipping now has to define a "global" mode regex (with the "g") flag. This is to be able to use lastIndex to tell the regex where to start skipping whitespace from. lastIndex works only for the "global" mode. The above limitation made the code a bit more complex than I would've hoped for, but it's not really bad. The performance, on the other hand, is terrific. 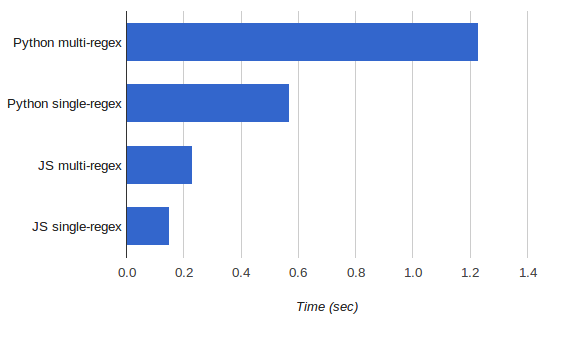 Running this on a recent version of Node.js (in other words, the V8 engine), it runs in 0.23 seconds, 5.3 times faster than the equivalent Python code and 2.5 times faster than even the optimized single-regex version. // If there are no more tokens in the buffer, returns null. // In case of an error, throws Error. // Shouldn't get here, because at least one rule matched. You'll notice that the code here bends over backwards to overcome another annoying limitation of JS regexes. There are no named groups, and no way to quickly find out which group matched in a particular run, without stupidly iterating over the results array! I was very surprised when I found this, and even asked a SO question, where I was told that this is the way things are. The loop over the results object in the end of the token method really bothers me a lot. It's so useless! My benchmark Tablegen tokenizer has ~30 rules, many of which have to be iterated over for each matching token. This lexer turned out to be a good exercise of the language's regex capabilities. Back in the day, it helped me learn some tricks in the original Python implementation (such as optimizing regexes by combining them into a single one, and also named groups). It also made me run into a couple of deficiencies of JS's regex handling when I was porting the code. And to run into a deficiency you really need to scour the docs and examples carefully making sure you're not missing anything. As I mentioned above already - I'm very interested in feedback - if anything can be done differently, please let me know.